How do you define visual thinking? What is it? What is it not? 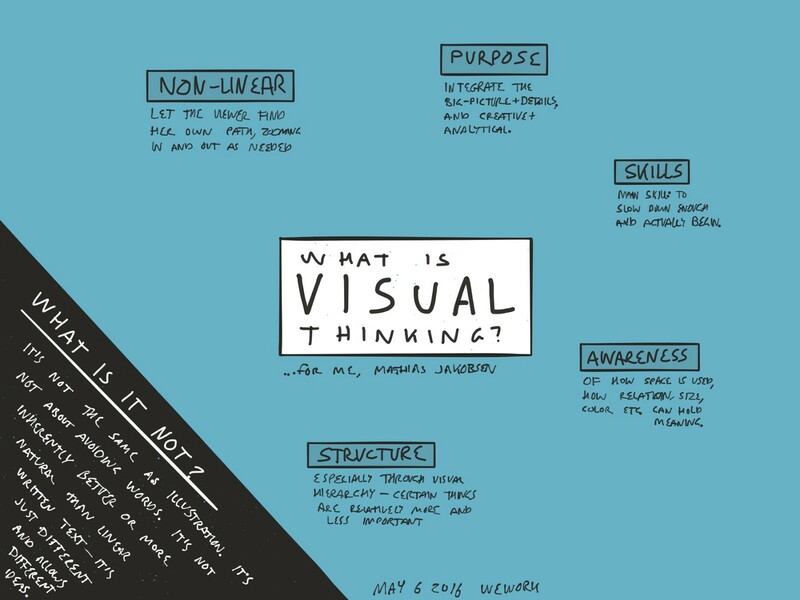 I struggled to write a linear text to define visual thinking. Then I decided to define it visually. Below is my attempt at a blog post. The most common misconception I meet when it comes to visual thinking, is that it’s about using less words and more illustration and drawing. Visual thinking is not illustration! Visual thinking does not mean replacing the word “car” with a drawing of a car. And being a good visual thinker has absolutely nothing to do with your ability to draw. You can be a visual thinker and only use words. In some cases you can use visual thinking in a dialogue without even putting anything on paper. It just requires more practice and thus, the best way to learn and practice visual thinking involves some amount of putting things on paper. So that’s a lot about what it isn’t. But if it is not just a matter of using illustration, what is it then? To me, visual thinking is closely related to concepts like non-linear thinking and holistic thinking, and must be seen in contrast with written text which is mainly linear, just like our stream of consciousness / mind chatter is one endless linear stream. There are two squares. One square is bigger than the other square. The bigger square is blue and the smaller square is red. In the text example the writer (me) has decided on the order. First the overall stage is revealed with two shapes (square). Then the size difference. Finally the colors. But an equally accurate description could be: red and blue colors. Next to each other. The blue is bigger than the red. They are each shaped like squares. Regardless of which description you prefer, the fact that they are written as linear text is enforcing a preferred sequential order. The visual does not enforce it. 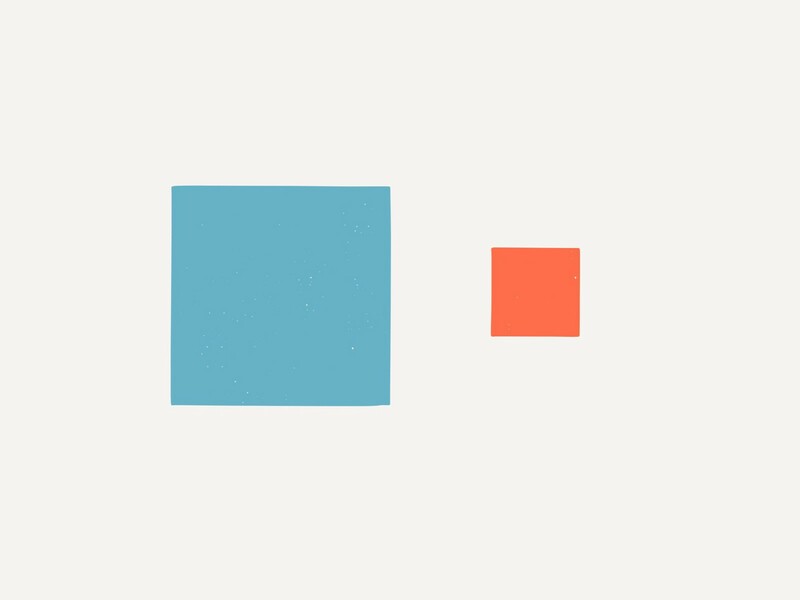 Some viewers will likely see the colors before they notice that the shapes are square. It allows our mind to process the different pieces of information in a non-linear way. This doesn’t mean that visual thinking doesn’t have any order. It must have. Good visual thinking uses the spatial relationship between the objects on the page to hold information. (In contrast, a page break in a flow of text holds no meaning) The relative size of objects has meaning. And details can be integrated within a context where the holistic (big picture) and detail can be seen together and in the context of each other. The ability to think visually revolves around an awareness of how all these levels of meaning work together.